Wales coach Shaun Edwards has not finalised his next move after the World Cup, with an agreed return to rugby league's Wigan appearing off the table. 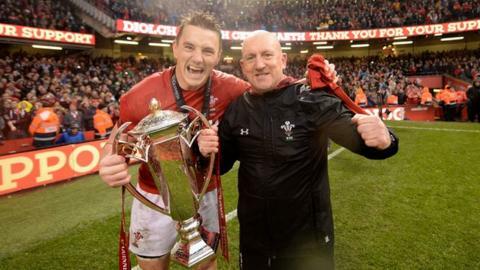 The defence coach, 52, claimed his 50th career winners' medal as player and coach as Warren Gatland's men sealed the Six Nations Grand Slam with a 25-7 victory over Ireland in Cardiff. Edwards leaves his Wales post after the autumn's World Cup in Japan. "I haven't signed a contract with anybody yet," Edwards said. He agreed a deal with Wigan Warriors in August 2018, but said the Super League club never produced a contract for him to sign. "I agreed with Wigan and thought we would sign a contract," he said. "But then Wigan said, 'it's OK, we'll sign one later', and I thought that was unusual. And that was nine months ago." Wigan said they were "aware of quotes from Shaun Edwards regarding his future contractual arrangements". In a statement, the club said: "Following the conclusion of the Six Nations and Shaun's comments, we have been seeking dialogue with Shaun directly since Sunday to clarify to Wigan his intentions". Edwards spent 14 years with Wigan as a rugby league player, earning 36 Great Britain caps. He said: "The only team I'm not going to go to is Wales, because the new coach [Wayne Pivac] is going in a different direction. Head coach Gatland will leave Wales after the World Cup along with Edwards, with Scarlets boss Pivac taking over for 2020. Edwards could now return to Wasps, where his previous spell - first as a coach under Gatland and then as head coach - returned two European Cups and four Premiership titles. "I'll consider all offers, league, union," Edwards said. Edwards commended Wales boss Gatland for producing his best-ever coaching in claiming his third Grand Slam in charge of Wales. Gatland predicted before the tournament started that if his side won in France in round one, they could pull off a Grand Slam. Edwards said: "Obviously, I've worked with Warren for many, many years now, and his coaching this campaign I think has been probably the best I've ever seen him coach. It has been amazing. "It was like going back to being at Wasps in the grand [Premiership] final weeks, when we won three grand finals on the bounce, and winning Heineken Cups. "One of the old Waspies texted me and I said it's just like grand final week again. And obviously it ended up the same result. "You reap what you sow, and in those down weeks Warren in particular is amazing at leading the lads, making them push themselves through the pain barrier, in the training, in the preparation."